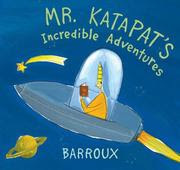 I picked up a copy of Mr. Katapat's Incredible Adventures at the library as part of my Reading My Library challenge. I was absolutely delighted to discover this particular title, written and illustrated by Barroux. I had no high expectations for it when I looked at the cover art but then I opened the book and WOW! Had to share it with the masses. but really he is a great adventurer. Every day, Mr. Katapat heads to the library. It's where all the excitement begins. This is a book lover's dream picture book. Bonus points if you love your local library! Mr. Kataput proceeds to have a lot of really cool and fun adventure (all with very simple sentence structures that make this easy to comprehend from the age of 3 on up). The book concludes with him bumping into the future Mrs. Katapat. LOVED this book. I thought it was clever and fun. But that is probably because I like books. I'm also really enjoying finding books just like this one at our local library. To see where I'm at in the challenge, visit Reading My Library.